Space western adventure spin off from the Star Wars franchise directed by Phil Lord and Christopher Miller and Ron Howard. It’s not yet known how the credits will be divided for the finished film as Howard took over the shoot three-quarters of the way through. The story is centered on young Han Solo (Alden Ehrenreich). Through a series of daring escapades deep within a dark and dangerous criminal underworld, Han Solo meets his mighty future copilot Chewbacca and encounters the notorious gambler Lando Calrissian (Donald Glover), in a journey that will set the course of one of the Star Wars saga’s most unlikely heroes. Lady Proxima: So you expect me to believe that you walked away with nothing! Han Solo: Well, I ran away with my life. I think that’s something. I mean, to me, that’s a lot. Lady Proxima: I trusted you with a simple task, and all I’m hearing are excuses. Lady Proxima: There must be consequences for disobedience or else you never learn. Han Solo: You know what, I don’t think I’m ever going to learn. Lady Proxima: What did you say? Han Solo: I said, next time somebody hits me, I hit them back. Han Solo: This is where I sign up to be a pilot, right? Imperial Recruitment Officer: If you apply for the Imperial Navy, but most recruits go into the infantry. Han Solo: I’m going to be a pilot. Best in the galaxy. Imperial Officer: You there, come with us. Imperial Officer: We have a few questions to ask you. Han Solo: How long is that going to take? Imperial Recruitment Officer: Depends on how good you are at following orders. Why, have you got somewhere to be? Han Solo: Yeah, back here, as soon as I can. Imperial Recruitment Officer: Don’t hear that much. What’s your name, son? Imperial Recruitment Officer: Han what? Imperial Recruitment Officer: Who are your people? Han Solo: I don’t have people. I’m alone. Imperial Recruitment Officer: Approved. Proceed to transport ID 83 for the Naval Academy at Carida. Good luck, Han Solo. We’ll have you flying in no time. Your Empire needs you. Han Solo: [to Beckett] Look, I came up running scams on the streets of Corellia. I was boosting AV-21 s when I was ten. I’m a driver, a flyer, and hey, you said yourself. I got to get out of here. Right? Rio Durant: What’s a fancy flyboy doing down in the mud? Han Solo: Well, I got kicked out of the Imperial Academy for having a mind of my own, but I’m a great pilot, and I got to get home. Rio Durant: This guy is nuts. No one goes back to Corellia. Han Solo: I got a reason. Han Solo: So what’s your name, anyway? Han Solo: Chewbacca? Alright, well, you’re going to need a nickname, because I ain’t saying that every time. Han Solo: Look, I waited a long time for a shot like this. I’m not about to screw it up, alright? Rio Durant: So what’s your sob story, flyboy? Rio Durant: You’re after something, I know the look. What is it? Revenge? Val: No, it’s not revenge. Look at him. If it’s anything, it’s a girl. Rio Durant: A girl! Tell us about the girl, Han. Is she nice? Does she have sharp teeth? Han Solo: There was a girl. But, uh, I got out, she didn’t. I swore to myself I’d become a pilot, get a ship, go back and find her. That’s what I’m going to do right after this job. Rio Durant: How do you know she’ll still be there? Han Solo: I just know. Rio Durant: What was he saying? Han Solo: He said the Wookiees were enslaved by the Empire, taken off Kashyyyk. He’s searching for his, uh, I don’t know if he said tribe or family. Tobias Beckett: What’s the difference? Tobias Beckett: He knows me, not you. If you come with me, show your face, if they don’t kill you, you’re in this life for good. Han Solo: You find some way to square this, we still get our money? Han Solo: For me, it’s worth the risk. Han Solo: How about you? Tobias Beckett: Sorry I punched your face. Han Solo: Happens more often than you think. Qi’Ra: I’m glad you got out. Han Solo: How did you get out? Qi’Ra: You look good. A little rough around the edges, but good. Qi’Ra: What should we drink to? Han Solo: Let’s drink two and see where it goes. Dryden Vos: I admire anyone who can crawl their way out of the sewer. Especially, a sewer as putrid as Corellia. Dryden Vos: The canisters will explode before you get there, so you’d need an incredibly fast ship and a brilliant pilot. Han Solo: We’ll find a ship. We’ve already got the pilot. Tobias Beckett: Do you got a line on a ship? Qi’Ra: I know a guy. And I know just where to find him. Han Solo: We get it. Qi’Ra: But he’s retired. Says he’s a sportsman now. Han Solo: All we need is his ship. Qi’Ra: Well, he’ll never part with it. He loves that ship. He won it playing Sabacc. Han Solo: I heard a story about you. I was wondering if it’s true. Lando Calrissian: Everything you’ve heard about me is true. Lando Calrissian: L3! Let go of the mean man’s face. We’re leaving. L3-37: They don’t even serve our kind here. Lando Calrissian: Who are these guys? L3-37: We’re taking them to Kessel. Han Solo: If she doesn’t want to fly, I’ll be your co-pilot. I don’t mind. Lando Calrissian: No, no. It’s okay. She’s definitely going. L3-37: Why? Because you’re my organic overlord? Lando Calrissian: Because I’m your captain, how about that? I actually would have her memory wiped, but she’s got the best damn navigational database in the galaxy. Lando Calrissian: Could use a fresh coat of paint, though! L3-37: Landonis, you do not want to press that button with me. Lando Calrissian: I don’t like it. I don’t agree with it. But I accept it. Han Solo: You’re getting the hang of this, Lando. Lando Calrissian: [to Han] You might want to buckle up, baby. Tobias Beckett: Look. I like you, kid. We got a good thing going here. Me, you, Chewie. Tobias Beckett: Right? The makings of a solid crew. But it does not work with Qi’ra. Han Solo: It worked with Val. You trusted her. Tobias Beckett: You want know how I’ve survived as long as I have? I trust no one. Assume everyone will betray you and you will never be disappointed. Han Solo: Sounds like a lonely way to live. Tobias Beckett: It’s the only way. Lando Calrissian: You need anything? Lando Calrissian: L3, what did you do? L3-37: I found my true purpose, Lando. That’s what I’ve done. I’m so glad we took this job! Han Solo: I got a really good feeling about this. Han Solo: A hundred and ninety years-old! You look great! Han Solo: Just did the Kessel Run in 12 parsecs. Han Solo: Not if you round down, buddy. Qi’Ra: Okay, outlaw, you can tell yourself that, but I might be the only person in the whole galaxy who knows what you really are. Han Solo: Yeah. What’s that? Qi’Ra: You are the good guy. Han Solo: I am not the good guy. I am definitely not a good guy. I’m a terrible person. Tobias Beckett: I’m leaving. If you’re smart, you’ll come with me. Han Solo: I thought you didn’t believe in running. Tobias Beckett: I prefer it to dying. Tobias Beckett: If by some miracle you make it out of here, find me on Tatooine. Han Solo: What’s on Tatooine? Tobias Beckett: Heard about a job, big shot gangster putting together a crew. That’ll be the one. Tobias Beckett: My last score. Yeah, I still got some debts to pay before I can head back to Glee Anselm and get into the valachord. Qi’Ra: I regret to inform you that Dryden Vos is dead, murdered by the thief he hired to steal the coaxium shipment, his friend, Tobias Beckett. Maul: Is that so? Where is the shipment now? Qi’Ra: Gone. Beckett took it. Slaughtered the others. I alone survived. Maul: One man couldn’t have done this alone. Qi’Ra: I wasn’t there, but if I had been, perhaps I could have saved him. Maul: [chuckles] Bring the ship and come to me on Dathomir and you and I will then decide what to do about the traitor, Beckett, and his accomplices. Qi’Ra: I’m on my way. Maul: Qi’ra, you and I will be working much more closely from now on. Lando Calrissian: You really have it bad for the Falcon, don’t you? Han Solo: It’s mutual, trust me. She belongs with me. Han Solo: You got everything you need there, pal? Han Solo: Not bad. Not bad. You know, if you’d only had this little green sylop, you would’ve beaten this. Han Solo: Fair and square, baby. Fair and square. Han Solo: Beckett said he heard about this very big gangster putting together a job. Han Solo: No, I’m telling you, it’s going to be great. When have I ever steered you wrong? 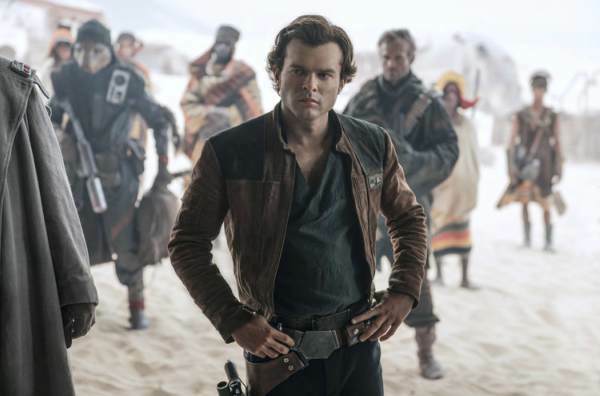 What do you think of Solo: A Star Wars Story quotes? Let us know what you think in the comments below as we’d love to know.
! ! ! Save your money ! ! ! If you’re like me and grew up with the first three Star Wars movies, you too will find this latest rendition a waste of time and money. so, we’ve come to know that the stories are always kinda thin, but this one is transparent. We paid extra to see it in 3D … more money wasted. The few scenes which might have benefited from the technology were a total wipe out. The screen is dark, the action slow, the dialog pathetic and the acting if you can call it that was beyond poor. This movie was so slow that Leni and I sat separately. Shortly after the fist quarter, Leni moved so that she could take out her tablet and finish a book she had started. She didn’t want to disturb me and I was hoping that the movie would get better. Oh, as for disturbing anyone else in the theater …. that was NOT going to happen, we were the only two in the entire auditorium. I guess others saw reviews and knew better than to waste good money on this trash attempt. Even with a theater discount, the two tickets still cost over $30. Han Solo, we barely knew ye. Billed as a “Star Wars” story, this film lacked anything so interesting as a sense of palpable urgency to drive it. Han’s backstory is presented in passable yet paint by numbers form, as Ron Howard dutifully bares this character’s ostensible soul. Yet, soul is exactly what is lacking in this CGI pastiche, as furry puppets and the usual villains and baddies once again say hello. It all feels a tad stale and formulaic, as Han’s life as a smuggler is brought to life. Han’s odd name and the reasons for it? Check. Han’s link to the Empire? Check. Han’s first (presumably) girlfriend? Check. How Han became a pilot and a smuggler and met Lando and Chewie? Check. It’s all freaking loud for the noise sensitive among you, and the bad guys are, frankly, rather dull. The female characters – namely his woman and fellow smuggler Woody Harrelson’s woman, played by Emilia Clarke and Thandie Newton – are disposable and uninteresting. For that’s exactly what they are, women who belong to men and not stand alones as powerful female characters. Paul Bettany, a good actor, is rather wasted in an unappealing role. Lando’s mouthy and funny robot is, in my opinion, the best character in it. For those hoping for some operatic style goings on, you will be left disappointed. The chase and action scenes are the true meat of this standard cinematic fare. Character development seems a thing of Star Wars’ glory days now. I long for movies that aren’t CGI fuckfests pandering to a certain marketing demographic, but actual movies that dare to show us real characters with real dilemmas. Han Solo himself pales as a Harrison Ford wannabee, a smirky pretty boy with no real depth behind the smile. The movie itself is, for some reason, filmed in a very dark colours, and I found the actors to be a tad too “in” on the joke. The joke being that this was the Han Solo movie avid Star Wars fans deserved. While the movie is not terrible, it seems more machine than imaginative beauty. This is yet another crass cash cow milking the masses for their dollars. It’s better than the Last Jedi, for sure, and much worse than Rogue One. But kids, it ain’t no Star Wars. Rating: C.
Really enjoyed the movie “Solo”, but I had one major reservation. At one point a major character talks about his greatest love in all the world. But when you can cross the galaxy in such a short time, its a lot like saying she’s my best girl friend in this neighborhood. The action was great and the story followed reasonably close to established facts until Darth Maul showed up as an older man. Wasn’t he killed in his first movie while he was still very young? Maul didn’t die, if you see the clone wars. Really, he probably had similar powers as Darth Plagueis, and survived. He has metal legs also.